Star Trek TNG A Final Unity: Walkthru. Includes a .gif map of the Platform Room. 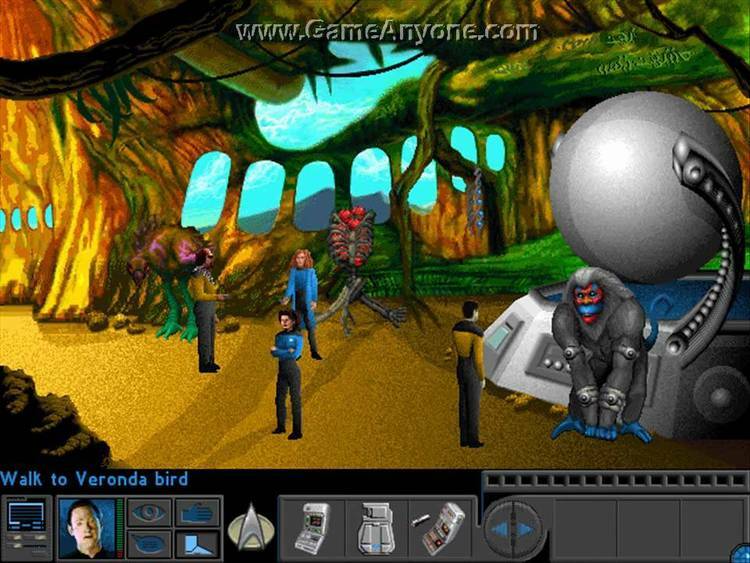 STAR TREK – A FINAL UNITY: Game walkthru. NOTE: All text in capital letters indicates a selected reply. practice, you'll get the hang of it! GENERAL TIP: Save the game at every oportunity! PICARD - WE'LL HAVE TO TAKE THAT RISK. MAKE IT SO. PICARD - WHO IS THE LAWGIVER? Picard sets a course for Horst III. On arrival in the sector a message will be recieved from Cymkoe IV. Picard is told about an attack on Mertens Orbital Station. Picard will decide to head for the station. Picard studies the station and discusses the situation with the crew. Data discovers a way to locate transporter co-ordinates on the station. Go to the transporter room. The mission objective is to eject or repair station power core. Leave room via door on left. Walk to woman under cable. La Forge uses tricorder on cable to get cable co-ordinates. Get La Forge to use transporter. Press yellow "Transporter Energize" button. Cable will appear in transporter. Get Dr. Crusher to use med-kit on woman. Get Riker to talk to woman. RIKER - WHAT HAPPENED HERE? Get La Forge to use control panel on right. La Forge will be advised that he needs an access code. Get La Forge to activate holotable. He will need a "Flux Router" to repair table. Dr. Benyt will give you access code. Return to admin level via turbolift. Get La Forge to use tricorder on strange machine. He will re-calibrate tricorder and use it on machine again. Get LaForge to talk to Riker. Get La Forge to use control panel near door. Press "Initiate Temporary Shutdown" button. Press "Shut Down Group 3" button. Get La Forge to pick up "Flux Router" from equipment cart. Get La Forge to use Flux Router on Holotable. Get La Forge to look at hologram. Return to Engineering via turbolift. Get La Forge to talk to Dr. Griems. Talk to Dr. Griems again. LA FORGE - MANUALLY, THAT'S VERY IMPRESSIVE. Get "Invertor Coupling" from equipment cart. Get "Wave Convertor" from equipment cart. Use Invertor Coupling on Hole In Casing. Use Wave Convertor on Hole In Casing. MISSION OVER - away team will be transported back to Enterprise. PICARD - SET COURSE FOR HORST III. WARP 5. End of conversation with Shanok. you will recieve a communication from Starfleet. Picard will set course for Morassia. Data will talk to the constable. Walk to doorway on left. Take carcass from Biotable after analysis and place under sonic scope. Put carcass back in original location. Repeat above process with the other two carcasses. Open a channel to Tracker Melas. Walk to Bogforest Biotope (front right path). Use Field Unit B on Tunnel 1. When field Unit returns pick it up. Use Bioprobe on Field Unit B. A sample will appear in inventory. * Repeat this process for Tunnels 2, 3 and 4. You will now have 4 samples in inventory. Use Microgenerator on Charging Unit to charge it. Use each of the 4 samples under Sonic Scope. Get Microgenerator (now fully charged). Walk to Marine Biotope (middle path, right). Follow same procedure as in Bogforest. Use field Unit C on the 4 Jellycorals (2 left, 2 right). Walk to Canyon Biotope (front left). Use Field Unit A on three locations: caverns, pit and crater. You will now have 3 samples in inventory. Use each of the 3 samples under Sonic Scope. Use Tricorder on Comms Port. Open a channel to Healer Zzolis. Constable will leave, wait for her return. After conversation with her, Data will need to go to Power Grid. Enter Shuttle Dock and Away Team will be taken to Power Grid. Use "Utilities Trunk" (near screen). She will instruct you as to how to use consoles. MISSION COMPLETED - Away Team will be transported to Enterprise. Picard will set course for Joward III in pursuit of Ferengi Trader. Picard will set course for Nigold System on advice from crew. PICARD - THIS IS CAPTAIN JEAN LUC-PICARD OF THE STARSHIP ENTERPRISE. WE ARE REQUESTING ASSISTANCE IN A SEARCH. Picard will set course for Shonoisho Epsilon VI. After conversation await response from Chancellor Laraq. After talking to Chancellor Laraq go to Transporter Room. On arrival Riker will talk to Laraq. RIKER - WHAT ARE THESE PYRAMIDS? Enter doorway to First Pyramid. Riker will be given an Orchestrion by Stamblyr. RIKER - WHAT IS THIS PLACE? RIKER - WHY DO YOU CALL YOURSELF THE CHANTERS? RIKER - LOVELY TEMPLE YOU HAVE HERE. RIKER - WHY IS YOUR GROUP CALLED THE SEEKERS? RIKER - WHAT IS THE GATEKEEPER LIKE? The Gatekeeper will awaken and ask you his questions. Q/BY WHAT RIGHT ARE YOU HERE? A/FOR ALL I KNOW, WE MAY NOT HAVE ANY RIGHT TO BE HERE. A/I'M NOT SURE OF THAT MYSELF. Q/HOW DOES A PERSON REACH ENLIGHTENMENT? A/EVERYONE PLAYS SO MANY ROLES IN LIFE...IT IS IMPOSSIBLE TO LABEL THEM. Q/HOW CAN THE SECTS BE MADE TO CO-OPERATE? A/I HAVE NO IDEA. THAT WOULD TAKE A BETTER DIPLOMAT THAN ME. After the Gatekeeper is satisfied with your answers the door will open. Get Riker to look at panel. Get Riker to look at sign. Get Data to look at Stasis Field. Get Data to look at panel. Get Data to look at sign. Get Riker to talk to Data. Walk to Hall of Triumph. Walk to doorway (bottom of screen). Walk to Landing Area (First Pyramid). Get Riker to talk to Laraq. He will give you a means of translating language on panel in Temple. Get Data to use Tricorder on sign. Get Data to use panel. Aelont will now be free of stasis field. Get Riker to talk to Aelont. RIKER - ARE YOU FEELING ALL RIGHT? Aelont will give Riker two talimans and a key to the vault. Use Thermacode Key on Vault. Use Gold Ring on hole. Get La Forge to use Device on Instrument. Walk to Pyramid near volcanoes (towards top of screen). Get Riker to talk to Madia. RIKER - WHAT'S BEHIND THIS FORCE FIELD? Madia will lower the force field. Use two pronged orchestrion on Device (transporter). Away team will be transported to Platform Room. at the start, but with reduced energy. Collect 1 pronged (covered) Orchestrion. Use 1 pronged (covered) Orchestrion. Collect 2 pronged (covered) Orchestrion. Use 2 pronged (covered) Orchestrion. Phew! - You should now be standing beneath the Niche. Use blue Talisman on Niche. You will now be transported to the Scroll Room. MISSION OVER - Away Team will be transported to the Enterprise. Laraq will now contact Picard. Captain Pentara will contact Picard. Picard will talk to Lukana. Garidian Warbird wil depart with refugees in board. The Enterprise recieves an emergency transmission from Starfleet. The Romulans have declared war (boo, hiss!). Contact Starfleet - this attempt will be unsuccessful. Worf will eventually contact Starfleet. Picard will be advised to go to Outpost 543. Picard sets course as ordered. On arrival at outpost use Comms. to contact Commander Chan. You will be instructed to go to the aid of a Communications Relay Station. PICARD - WE'RE ON OUR WAY. Picard will set course, as instructed. On arrival Worf will detect three Romulan Warbirds (boo, hiss!). PICARD - PREPARE TO ENGAGE, MR. WORF. The Warbirds will retreat (hooray). PICARD - CHANGE COURSE TO INTERCEPT. One Warbird will break-off to attack the Enterprise. On attacking the Warbird, it will initiate self-destruct. After Warbird self-destructs Picard will scan sector. Contact Commander Chan via Comms. Picard will be given another assignment. This request will be turned down. Picard is ordered to help the Klingons against an attack by three Warbirds. Picard will set course for system. On arrival Worf will detect a Romulan vessel (boo, hiss!!). PICARD - INTERCEPT THE TARGET. Picard will recieve a message from the Klingon Vessel. Picard will then discuss situation with crew. Picard will give his report. After his report he will recieve a signal from Starfleet. On arrival you will recieve a message from Chancellor Laraq. Continue on course to Frigis. After destroying Wardbird Picard will want to beam down to Frigis. Get Picard to speak to Laraq. PICARD - WHAT DO YOU KNOW ABOUT CHODAK TECHNOLOGY? Picard will then transport back to Enterprise. Data will complete analysis of crystal. Picard will recieve an automatic message transmitted by Shalok. Picard will beam down to Horst III. Fire Phaser at rubble - highest setting. A passageway will be revealed. Use Isolinear Rod on Aperture. Walk to Rear of Site (left). Use Tricorder on Instrument Housing. Walk to Main Area (right). Walk to Access Shaft (right). Hail Ship via Comm Badge. MISSION COMPLETED-Away team will be transported back to Enterprise. Worf will recieve a message from Starfleet. Picard will set course as instructed. After destroying alien vessel Picard will discuss encounter with crew. Get Picard to talk to Data. Picard will consequently set course for Allanor. to replenish Photon Torpedoes. Starbase 131 is in sector 01-03-01.
that appears at middle bottom of bridge screen. Data will find a Transporter point below surface of Allanor. Picard will head the Away Team. Use Tricorder on Schedule Screen (back of room). In the next room use Display Panels(top of stairs,right of screen). Use Rod on Port (bottom right). Computer will display a menu (three options). Select "Done" when La Forge and Picard have finished studying info. You will be returned to Main Menu. Wait for a menu displaying "Activate Facility" and "Exit". Wait - you will be returned to Main Menu. You will leave Control Panel. You will now be in the Drone Repair Area. Use Sheet of Metal on right of screen. The Sheet of Metal and a Paperclip will appear in the inventory. You will witness a Drone being repaired. Data will discover how to deactivate the Drones. Return to Walkway on left. Return to Ventilation Duct on left. You will now be back at the Beaming Down point. Remove Foreign Object (Logic Inhibitor) from the deactivated drone. Drone which will confiscate your weapons if not deactivated. You will now have Logic Inhibitor in inventory. Return to Drone Repair Area (right of screen twice). Walk to door at far rear of Drone Repair Area. Drone has gone through door. Get Data to use Tricorder on Alien Device just below Door. indicating location of Logic Circuitry for door. When next Drone approaches it will stop. Remove Logic inhibitor from logic circuitry. Door will now open allowing access to next room. You are now in the Drone Charging Area. Get La Forge to use Display Panel (near Away Teams point of entry). Two options offered - "Power Off" and "Station Offline". Select "Power Off" - "Power On" will now appear. Select "Station Offline" - "Station On Line" will now appear. The Charging Unit will now be back in operation. Green lights will illuminate on the side of the Charging Capacitor. Select "Power On" - "Power Off" will appear. When Capacitor is down to one green light Use Phaser on Capacitor. Charging Machine will be destroyed thus allowing Away Team to continue. The Chodak will eventually appear. Follow the Chodak to next location when invited to do so. Picard will now be face-to-face with the Chodak. Get Picard to Talk To Alien on far right. this will prevent them from memorising the route to the next location. The Chodak Admiral will introduce himself and use the Rod on the Computer. This will reveal valuable information concerning the Unity Device. The Chodak will eventually leave. The computer is stll active. Walk to back of location. At new location you will witness departure of Chodak. Use Med-Kit on dead Optimator. Data will synthesise a stimulant for Optimator. A Stimulant will appear in inventory. Use Stimulant on injured Optimator. Picard will talk to Optimator. Picard will be given a security code by Optimator. Use Security Panel (near injured Optimator). Insert Wire Loop (paperclip) into hole (left of rod). Security Rod will appear in Inventory. Use Security Rod on Port. Walk to Stairs (top left). Walk to Hall (back of screen). The Away Team are now in Chodak Transporter Room. This is the Control Panel for Transporter. Use Engage Button (bottom right). Use Bar Gauge (timer) on right of screen. Last member of Away Team will be transported. Entire Away Team will appear at new location. Walk to Door (front left). Away Team is back at location where Picard first met Chodak Admiral. Walk to Charging Station (left). Walk to passage (bottom left). Walk to Chamber (bottom left). Walk to Ventilation Duct (left). Away Team has returned to "Beam In" location. Hail Enterprise via Comms. Badge. END OF MISSION - Away Team will be transported back to Enterprise. Picard will discuss the gathered information with rest of crew. PICARD - YOU'RE RIGHT, NUMBER ONE. TAKE US BACK INTO FEDERATION SPACE. Data will surmise information gathered so far. PICARD - LAY IN A COURSE FOR THE GAMBARA NEBULA. Black Hole thirty years previously. location to view the light from the Pulsar. Set a heading of 06-05-06 (Zephyrus Sector). On arrival Enterprise will probably encounter Warbird at this location. Select Stellar Map (middle button). Set a Stellar Heading of 03-08-12. On arrival Data will detect a light reading from Pulsar, as planned. Data will tell Picard that the Unity Device is in Sector 03-01-03. Set a heading of 03-01-03.
heavy resistance before reaching destination. Set a heading of 09-14-16. Picard will give the order to approach the Unity Device. Garidian Warbird arrives and hails the Enterprise. Chodak Dreadnought arrives and hails the Enterprise. On completion of conversation Chodak Dreadnought prepares to attack. Garidians send shuttles down to the surface of the Unity Device. On arrival walk to Interior Bay (left). Send Worf through transporter first. Each member of the away team must step onto transporter pad individually. Only Picard will arrive at new location. Get Picard to look at Glow (left). PICARD - WHO ARE YOU? The alien does not respond. At new location Picard meets Brodnack and Pentara. At new location Pentara will suggest an alliance to Picard. At new location Picard will be met by a Picard from the future. Picard is given a Device. Picard - YES, LETS GET ON WITH IT. Speak to Brodnack and you will be told of second Test. Picard will pick up the semi-circular blocks. Picard goes first with test. Use Disk Half on Left Receptacle. Pentara and Brodnack take their turns. Brodnack decides to co-operate with Picard and Pentara. Get Picard to examine Field Generator. Use Disk Half on Disk Half to create a complete Disk. Use Disk on (lower) air gap. Look at Field Emitter (top). Look at (upper) air gap. Look at (lower) air gap. Picard will ask for the other four Disk Halves from Pentara and Brodnack. Insert both Disks into lower air gap above Picards Disk. The Force Field will be deactivated. Get Picard to use Artifact. He will be transported across chasm. Use artifact twice more to transport Brodnack and Pentara. Force Field in Doorway will be deactivated. Use Symbol on First Door. Use Panel to right of Stasis Chamber. The Judge will come out of stasis and talk to each of the candidates. PICARD - THE UNITY DEVICE SHOULD BE USED FOR THE GOOD OF ALL. The Judge will interrogate each of the candidates. Once he is satisfied he will open the Door. This will take the candidates to the Unity Device Intelligence. The Unity Device wil claim all candidates have passed the tests. candidates the opportunity to take action against the Borg. A Control Panel will appear. Get Picard to deactivate Panel. Picard will then explain his actions. Now, sit back, relax and enjoy the exciting end sequence! WILL THE ENTERPRISE BE DESTROYED? NORWEGIAN CHOPPER FORCE:THE FIJORDS OF DOOM! Probably the worst game ever written!